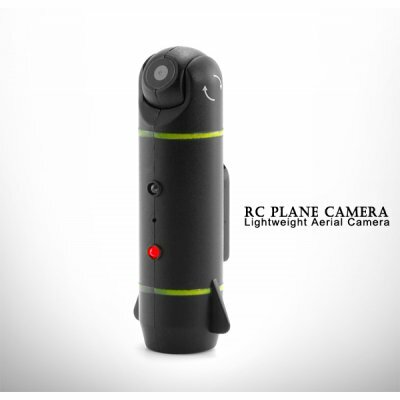 Successfully Added RC Plane Camera - Lightweight Aerial Camera to your Shopping Cart. Capture breathtaking aerial videos with this lightweight RC plane camera for RC planes, helicopters, kites, parkflyers, and more! If you own any kind of RC flyer or kite then you can appreciate just how fun it is to fly. However, controlling flight is only half the fun. To really get the most from the experience you’ll need a lightweight aerial camera. This allows you to view exactly what your RC flyer or kite is seeing while it maneuvers gracefully through the sky! We promise once you experience just how fun watching your aerial videos are that you will never fly without your RC plane camera again! This RC plane camera records beautiful 640 x 480 videos at 25 frames per second (FPS) for smooth motion capture. Videos are stored on the internal 4GB memory which allows you to save up to 1.5 hours of video on a single charge or over 300 photos at an impressive resolution of 1280 x 960 for excellent image quality. And since the head of the camera can rotate up to 70 degrees you will always get the perfect viewing angle every time. This lightweight RC plane camera comes with an easy to install camera mount that attaches to any RC flyer or kite in less than 2 minutes. The camera and mount are constructed from durable yet light weight materials so the total weight is only 27 grams (camera is 20g). This allows you to capture breathtaking videos without degrading the performance of your RC flyer due to excessive weight like most cameras have. This RC plane camera is about half the cost of similar branded cameras and the quality is just as good, and in many cases much better. That’s because we purchased this aerial camera direct from the factory and in bulk. At such a low wholesale price you really can’t go wrong with the CVQX-G234 RC plane camera. Order one now and don’t forget, we will ship out your order by tomorrow and provide you with a full 12 month guarantee. RC plane camera for RC planes, helicopters, kites, and more! You can change the photo capture interval from one photo every 5 seconds all the way up to one photo every 60 seconds. This is done by using the included software located in the root drive of the device. Just connect the device to your computer and open the file named “PENDV_RTCTOOL.exe” located in the root drive of the device. Then simply select the icon that says “Get PC time”, this will then sync the RC plane camera with the current time/date of your PC.